The chart below shows the Italian MIB30 index. The red blotches from 2000 to 2002 mark the succession of lower peaks (or highs) and lower troughs (or lows) that provided confirmation that a severe downtrend was in place. Each trough represents a temporary level of support and each peak a level of resistance which suggests that in this case, investors are continually lowering their expectations i.e. they are lowering the levels are which they are prepared to buy (the support level) and consequently the price keeps making lower lows. 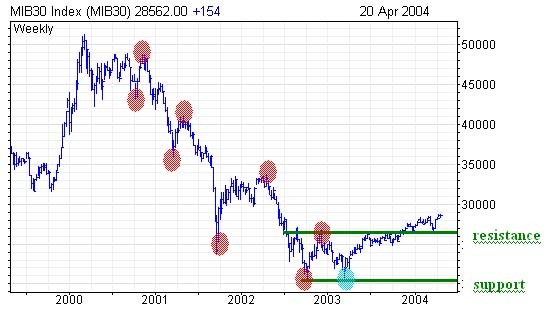 From the above chart, we can first identify a potential change in trend in March 2003 (the blue blotch). At this point, although the index remained in a downtrend, it made a double bottom, or did not make a lower low, i.e. investors were prepared to support the price at the same level as in October 2002 (the previous low) which was a clear signal of an improvement in sentiment. 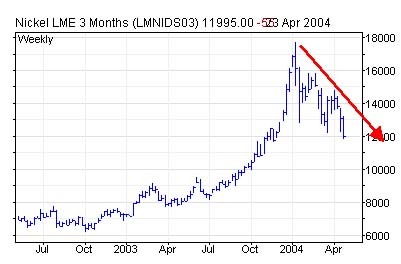 This equal low represented a first sign that a change was possible but it was not until mid-2003 that the price broke above the prior high (the last red blob) that we could suggest a change to an uptrend when the previous resistance of late 2002 had been breached. The above formation can also be referred to as a “base formation” with the price moving between support (at the lows) and resistance (at most recent highs) in a trading range. Once resistance is broken, we can refer to this as a “base breakout” and look for further comfort when the price manages to find support above the prior resistance (remember the rule: resistance becomes support and vice versa). You can just see this happening in the above chart. Of course, it’s always easier to spot a trend change in hindsight ! But if we follow the rules rigorously [and accept what the charts tell us] we will be able to observe and anticipate price trend changes. Another rule to remember is that the more times a price finds support at a particular level, the stronger that level of support is (vice versa for resistance). Let’s have a look at another example. The chart below shows the US S&P 500 index over five years (weekly bar chart). 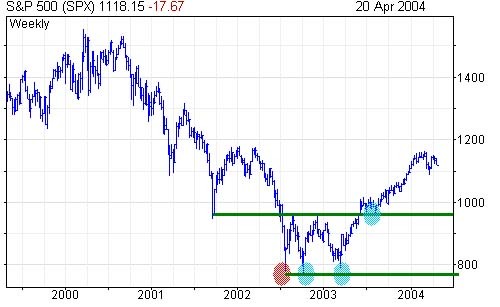 Notice the chart action from mid-2002 to March 2003 around the 800 level. Each time the price bounces from a particular support level, more investors will identify this level and build it into their trading strategy. This is the direct application of human behavioural observation. Notice also that once the index has cleared previous highs or resistance at just below 1000 (the top green line) that this level turns into support (the last blue blotch). Not surprisingly, the double top formation is the inverse of the double bottom. In this case, the price fails to make a new high i.e. investor demand is no longer expanding and reaches equilibrium with supply at the same level rather than a higher level. 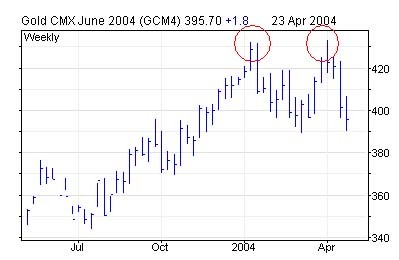 Double top formation in Gold Futures in April 2004. Another formation which is widely referred to is the head and shoulders formation. This differs from the double top in that the first evidence of its development is the generation of a lower high rather than an equal high; in other words, sellers are beginning to appear at lower levels than they did previously and the buyers no longer have the same appetite at these higher levels as before. The diagram below is an example of the head and shoulders top. The high A is referred to as the first “shoulder” and the high B as the “head”. The most recent lower high C is referred to as the second “shoulder”. A trend line can be drawn below the recent lows and this is referred to as the "neckline". The change of trend is signalled by a decisive break below the "neckline". The previous examples use the relative positioning of peaks and troughs (Dow theory) to determine changes in trend and these can take weeks or months to develop. The V reversal is a much more dramatic event and unlike double bottoms, there is no higher low to alert us to a potential signal and generally we cannot identify this signal until the day after the reversal. Before a bullish reversal, prices will begin to accelerate downwards. This action suggests that there is fast becoming a bearish consensus i.e. the vast majority of investors are bearish and the price drops faster and faster as the few remaining bulls throw in the towel and liquidate their long positions – this phenomenon is also known as “capitulation”. Analysts who are alert will flag this chart and comment that it is looking “overextended” or oversold. Momentum indicators define this oversold status further (covered later in this tutorial). 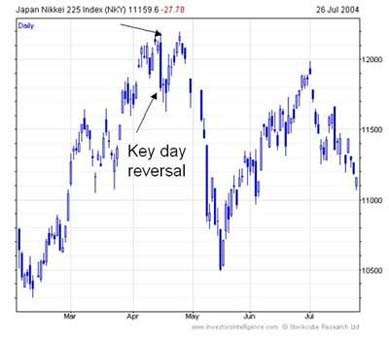 The reversal signal culminates when the price makes a new low but then reverses up sharply the same day and actually closes higher than the previous day; this is also known as “a key day reversal”. Let’s try and look a little closer at what is happening to investor sentiment during a bullish reversal. As discussed above, we know that immediately prior to the reversal, investors have capitulated i.e. the last few bulls have vanished into thin air and that virtually everyone is now bearish. However, the majority of those who want to sell will already have sold on the way down so, eventually, the supply will dry up. All it takes now is for one short trader to take some profits (buy back) or a few bulls to do a bit of bargain hunting and we have an imbalance i.e. the supply (the bears or sellers) have dried up and we have an increase in demand (bulls or buyers). This will create a reversal and the sudden up-move will trigger other short sellers to close out positions and further bargain hunters to step in causing further upward pressure. This reversal is identified by an emphatic reversal of price action, where in an uptrend the instrument opens up but then closes below the low of the day before. 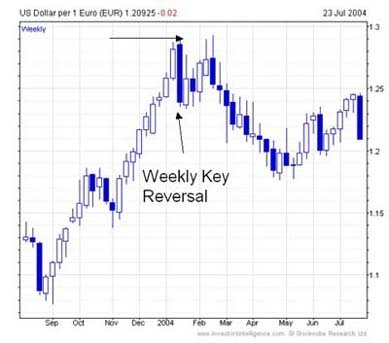 This is identical to the key day reversal but on a weekly chart. When this occurs it is a very strong reversal signal. The bearish reversal is the inverse of the bullish reversal as discussed above. It is a dramatic top formation and develops when prices have accelerated higher and become overextended on the upward side. It is characterised by a new short term high followed by the price closing the day lower. 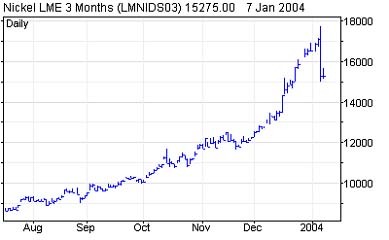 Nickel accelerated up to a new historic high in January 2004. However, on the 6th January it reversed to close the day sharply lower. The reversal in January signalled the top and Nickel prices have moved steadily lower since this time. It is not uncommon for an instrument to regain composure after a reversal and revisit the level at which the previous reversal took place. However, it is more than likely that this level will have become a powerful level of support or resistance and may generate a further reversal signal. The above example of Nickel can also be referred to as a “buying climax”. Investors Intelligence uses this term to describe a more specific event which occurs over a one week period. A buying climax is where a stock makes a new 52 week high but then closes below the previous week’s close. A selling climax is where a stock makes a new 52 week low and then closes above the previous week’s close. The reason that we use such a rigid definition for climaxes is that this enables us to classify accurately and consistently what is and what isn’t a climax. This is important as we maintain historic records of the climaxes generated each week and have noted that important market turning points are often accompanied by a sudden rise in the number of buying or selling climaxes. A great example of this was in October 2002 when the Dow Industrials made its final low of that cycle. At this point, our US Market Timing Service observed a massive increase in the number of US stocks generating selling climaxes.